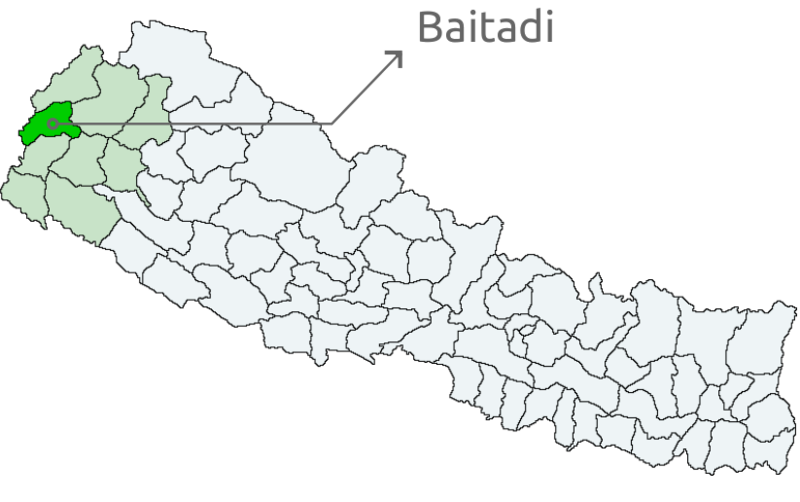 Baitadi is one of seven district in the far west region of Nepal. According to the UN, it has one of the lowest HDI (0.391) in Nepal and the literacy rate of women stands at 49%. OLE Nepal worked closely with development partners and local bodies such as the District Education Office (DEO), Department of Education (DoE), UN World Food Programme and Embassy of Finland’s Fund for Local Cooperation (FLC) throughout the launch of the project. The plan and execution of the launch went smoothly by drawing from the experience of previous deployments in the far west region. 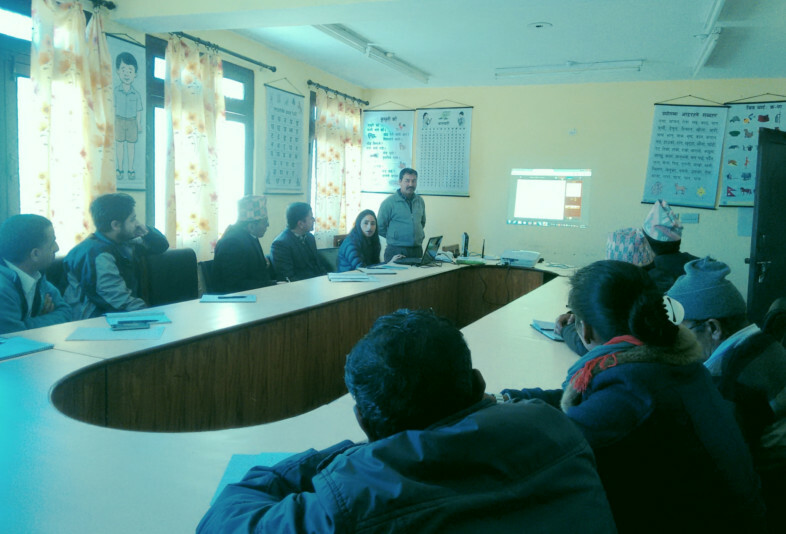 The process of introducing laptop base teaching program formally began in Baitadi with the orientation of district officials at the District Education Office (DEO) on February 20, 2016. The program took place at the DEO office, was attended by Chief of Baitadi DEO Mr. Lal singh Ter, WFP Sub-Office staff Mr. Binod Dev Bhatta, FFE Baitadi staff Mr. Rishi Ram Bimali, World Education program officer Mr. Padam Singh Dhami and other DEO staff including school supervisor and resource person. Deputy Director from Department of Education Mr. Dhan Bahadur Shrestha also travelled from Kathmandu to attend the program in Baitadi. The meeting concluded with an agreement of cooperation by the DEO office at the local level while implementing program. OLE Nepal and Baitadi DEO had announced a call for application to primary schools through the local FM stations and newspaper advertisements. The application forms were made available at the DEO office, resource centers and Food for Education (FFE) offices. A total of 38 applications received by the DEO were carefully reviewed by OLE Nepal and DEO staff, and 24 schools were shortlisted based on the number of students, teachers and school infrastructure. Two teams consisting of OLE Nepal staff, DEO and FFE officials conducted site survey of the 24 schools on May 21 – 29 to check the infrastructure, meet with teachers and community members, and to assess how well the schools fit the criteria set by the DEO and OLE Nepal. Since many of the schools were located in far flung communities, the teams were often required to walk for days on difficult hilly terrains. 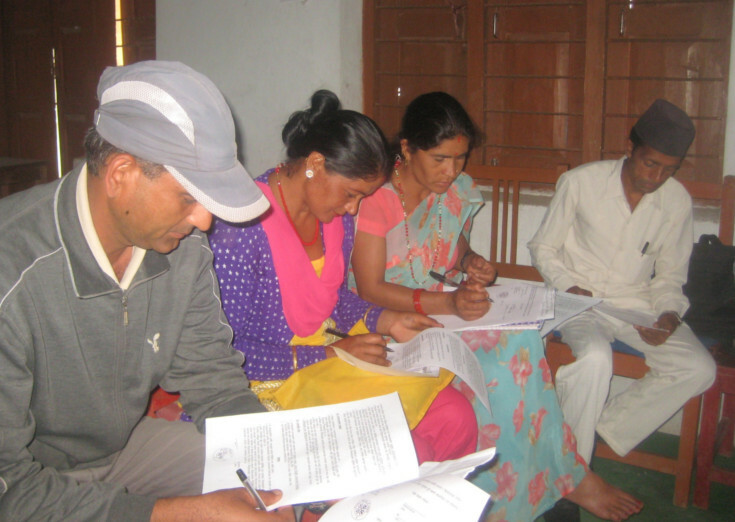 Upon completion of the survey, the teams convened at the DEO office and selected 15 schools. 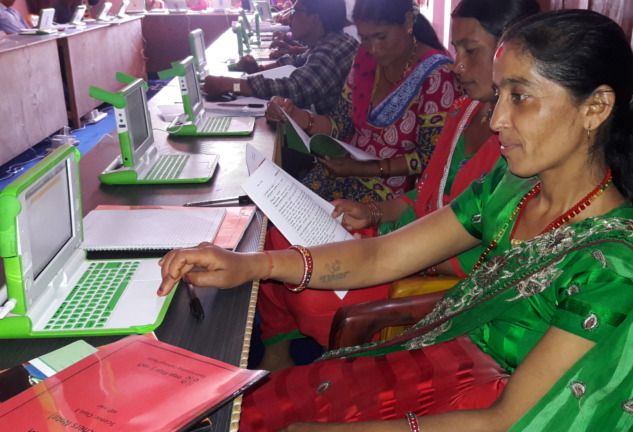 After the approval of the DoE, an orientation program was held in Baitadi for 15 schools that were selected for the laptop program. The program was organized in three sessions on June 28 – 30 in two different locations. Each of the 15 schools were represented by the head teacher, school management committee chair and parent teacher association representative. OLE Nepal, DEO and FFE staff provided detailed information about the program to the participants, discussed the roles and added responsibilities of the schools and communities, and answered questions from the participants. At the program, each school signed an agreement to work with the OLE Nepal and DEO to carry out the program, participate actively in the project activities, ensure safekeeping of the equipment, and make maximum use of the resources to improve teaching-learning in their classrooms. Only 1 school out of the 15 selected schools had electricity to power the laptops and other electronic devices. In our previous project schools, we learned that the power requirements needed to run the program can be met with solar power systems. 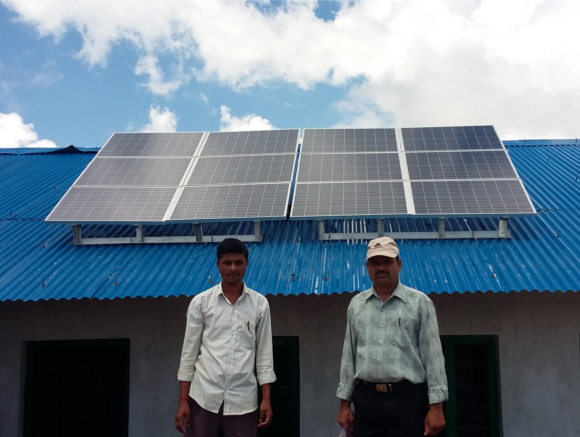 Suryodaya Urja was selected through a competitive bidding process for the installation of solar and power backup system in Baitadi. Before placing the purchase order, OLE Nepal also visited their office to learn about the various options and get the first hand information about the different components that were to be used. Solar panels were installed in the 14 schools and battery power backup system were installed in all the schools to ensure the classes could run smoothly. The solar and battery power back-up systems for all schools in Baitadi were provided by Embassy of Finland’s Fund for Local Cooperation. 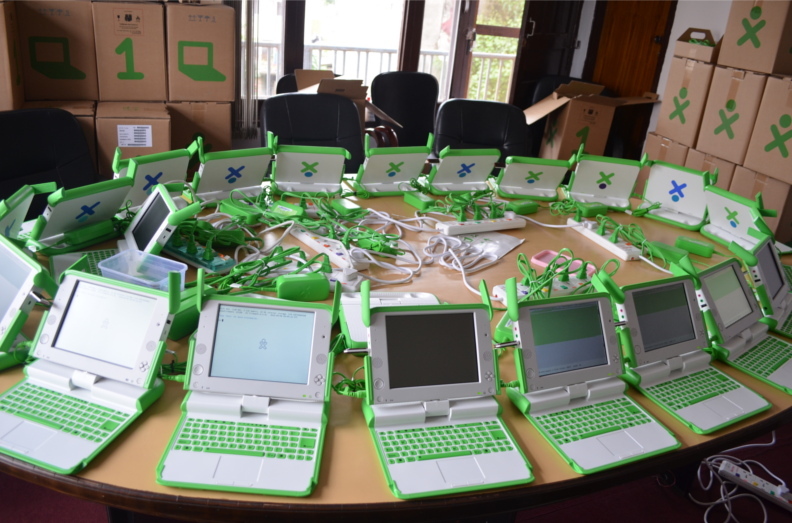 The XO-4 laptops were procured from the funds raised by OLE Nepal from individuals and organizations in Nepal and abroad. The laptops were ordered in May, 2016 and they finally arrived at OLE Nepal office in Sanepa, Lalitpur on September 6, 2016. Our technical team checked all the contents, tested each laptop and its parts and ported the software bundle of E-Paath, our interactive digital learning software. In just 3 days, our team was able to unpack, test, flash, label and re-pack the laptops to be transported to the respective schools in Baitadi. 107 sets of specially designed desks and benches for program schools in Baitadi were manufactured in Kathmandu. OLE Nepal provided the design and specifications of the desks and benches, and monitored during the manufacturing process. 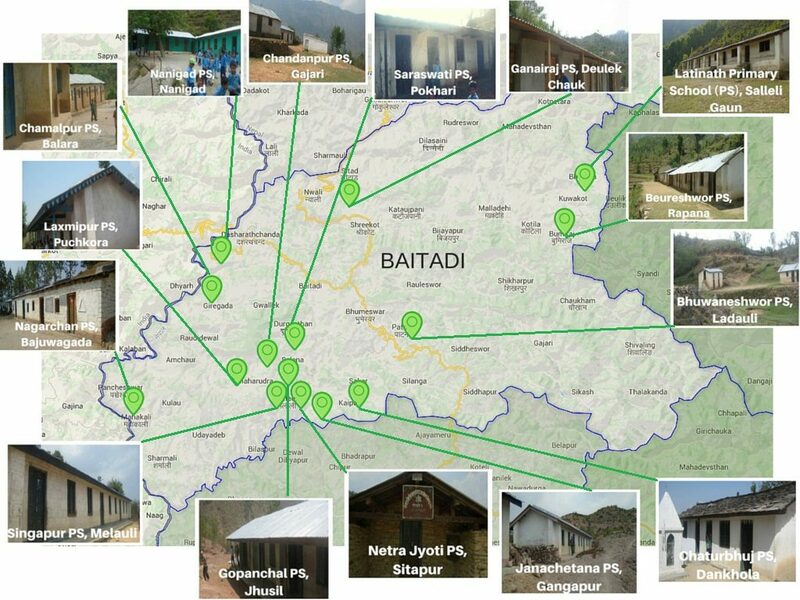 We provided the number of desks and benches to be delivered to various drop off locations in, Bithad, Melalui and Dehimandu areas of Baitadi district. 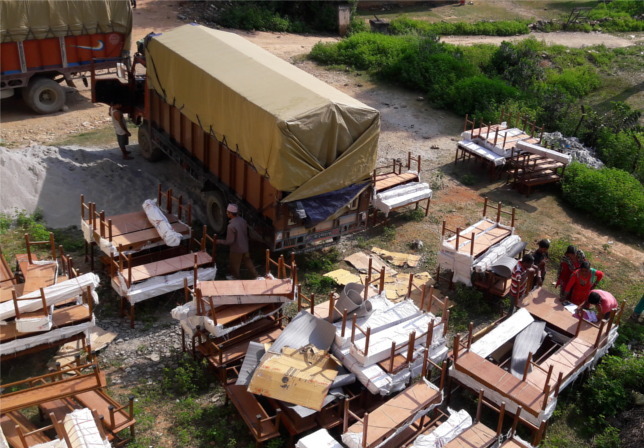 Our field coordinator Mr. Bhim Dhami was present at the drop points to monitor the drop off of furniture. We would like to thank our OLE Ambassadors, Anjuli, Ram and Karen for helping raise funds for children in Baitadi. Their efforts have helped us successfully raise funds for 312 laptops for 15 schools. Anjuli Piya participated in the Marine Corps Marathon and completed her first marathon on October 25, 2015 in Washington DC. She helped raise funds for Open Learning Exchange (OLE) Nepal to reach out to mothers in Nepal. Thank you Anjuli and everyone who supported her in this effort. Ram Khattri Chettri and Karen James hosted the OLE Nepal Annual Benefit Dinner on November 7, 2015 at their home for Open Learning Exchange (OLE) Nepal. Special thanks to the communities in Goshen and Middlebury, Indiana for your generous contributions. We would also like to thank our partners, UN World Food Programme amd Embassy of Finland’s Fund for Local Cooperation, for their support. The procurement of the laptops would not be possible without their support towards our campaign of reaching more schools for quality education in rural of the country.